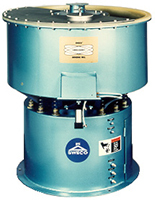 SWECO Vibro-Energy Grinding Mills are the most versatile line of mills available today for fast, low-cost particle size reduction to sub-micron range. Vibro-Energy grinding action achieves higher output per input horsepower; precise control of size and distribution. Product contamination from media and lining wear is virtually eliminated. Maintenance costs are low because of few moving parts and replaceable linings made of abrasion-resistant metal, ceramic or elastomers. 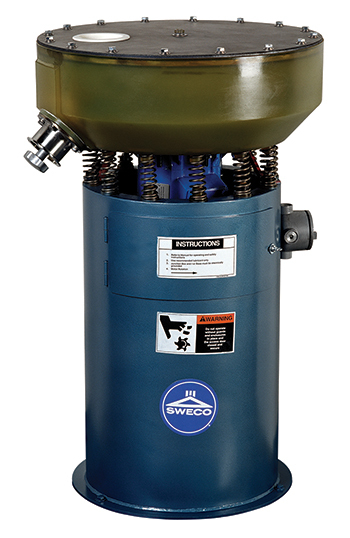 The SWECO Vibro-Energy Mill’s unique vibratory motion, coupled with the use of cylindrical media, allows a dense packing of the media bed assuring maximum media surface contact and minimum void area when operated under a low energy condition. Feed materials as large as 300 microns can be reduced to sub-micron sizes. In the high energy configuration, feed materials as large as twelve inch agglomerates have been successfully milled and solid particles of a half inch are being reduced to a d50 of less than 5 microns. The low energy condition is reserved for wet milling whereas the higher energy mode can be used either wet or dry. Vibratory Grinding Mills Size Reduction Equipment SWECO also carries a full complement of parts and accessories for the Vibro-Energy Grinding Mills. Ancillary features include components such as SWECO’s newly developed door plug, FDA linings for sanitary applications, and various grinding pots for smaller lab size units. Grinding Media is also available through SWECO for our customers’ convenience.